Human plasma was collected from 5 male and 5 female samples. Samples were diluted from 1x to 4x with assay buffer prior to performing the assay. 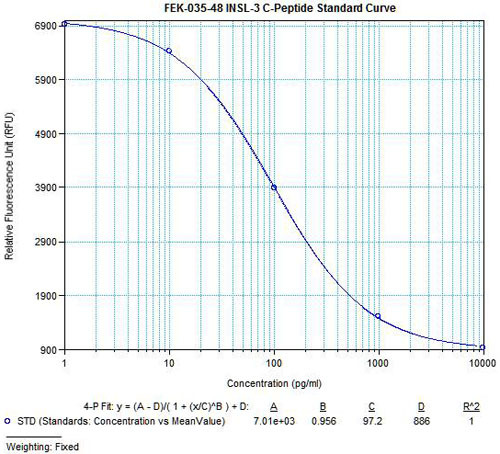 INSL 3 and INSL 3, C-peptide levels were then measured using both RIA and fluorescent EIA kits from Phoenix Pharmaceuticals, Inc. 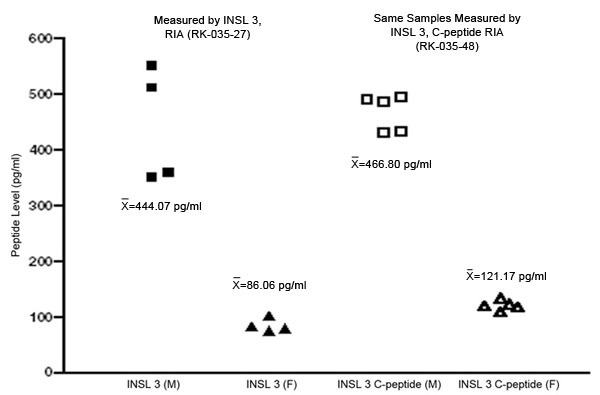 Using both RIA and fluorescent EIA kits, average INSL 3 concentrations were found to be signifcantly elevated in human male plasma when compared to female plasma. This supports previously published research. 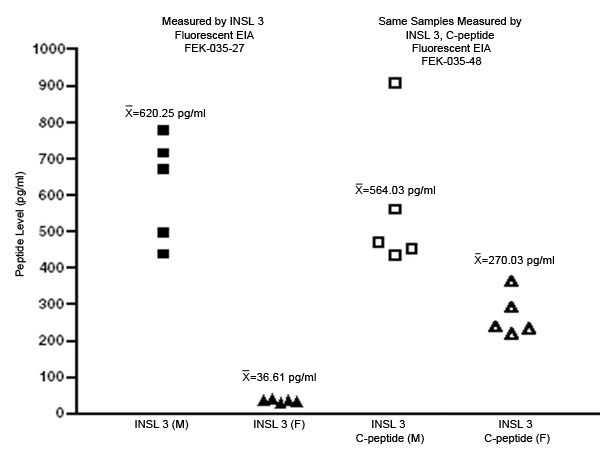 Similarly, INSL 3, C-peptide concentrations were significantly elevated in human male plasma when compared to female plasma. 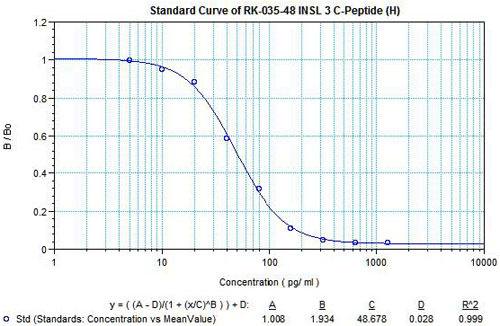 Therefore, we believe INSL 3, C-peptide may be able to replace INSL 3 as a more stable biomarker for hormone dysregulation. 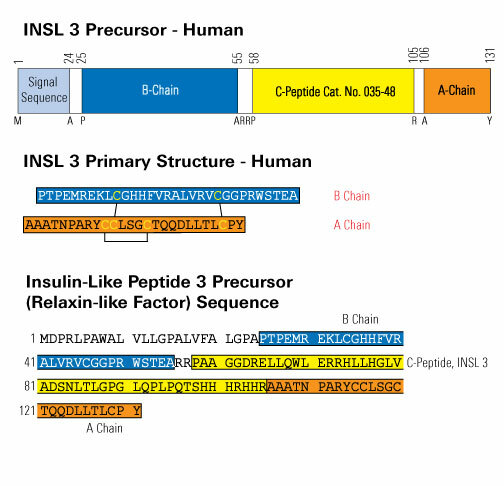 Using SSCP analysis, we have identified three variants involving the coding region and one involving the intron in the INSL3/RLF gene. The 2450C T mutation that changes codon 49 from arginine to a termination codon is clearly a deleterious mutation because it leads to a truncated protein product lacking the A chain. The 2511 C-T change that changes codon 69 from proline to leucine is likely deleterious because it leads to a nonconservative amino acid change, changes a highly conserved residue, and occurs in less than 1% of the population (Fig. 5). 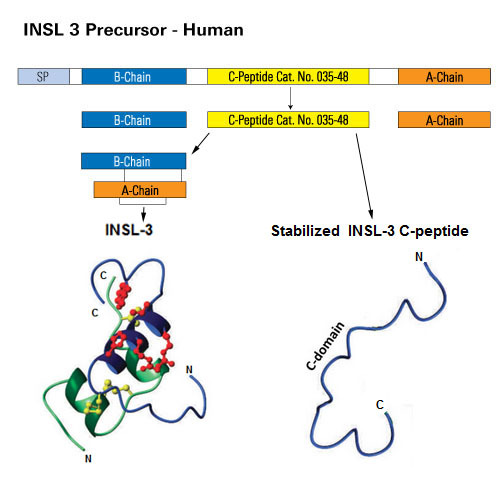 Both mutations occur in the connecting peptide region of the INSL3/RLF protein. The intron variant seems to be a rare polymorphism occurring preferentially in African-Americans. The linked L18L;A36T variant seems to be a common polymorphism because the frequency of the less common allele is high and is similar among the patients and control subjects (32.8% and 29.2%, respectively). Comparison of protein sequences. Amino acid residues are indicated by the single universal letter code. The R residue at codon 49 and the P residue at position 69 are underlined.